Every brand in the world, however big or small, should have a set of cohesive branding guidelines to help maintain its identity. 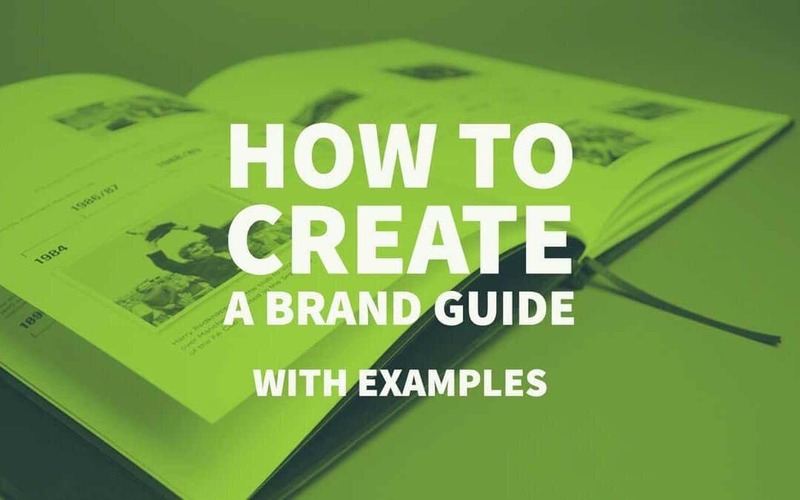 A strong brand guidelines document, which could range from 5 to 500 pages, lays out how the brand should be portrayed in communications, however formal or informal. 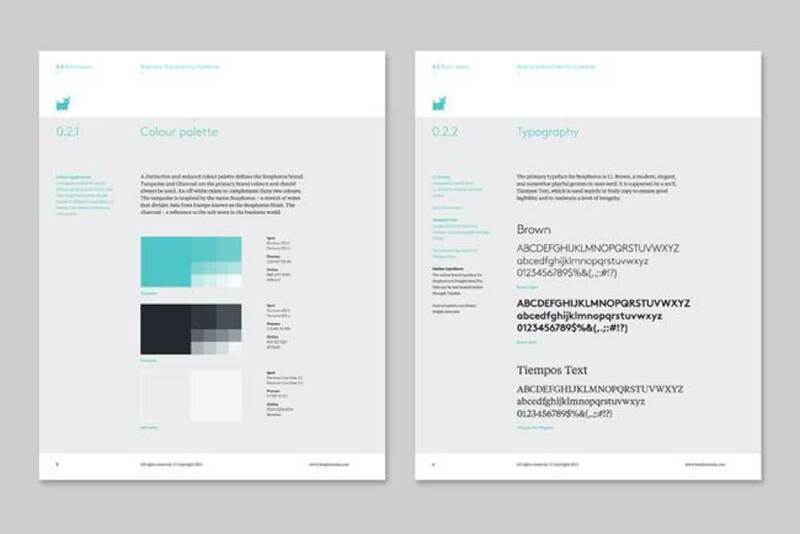 If you are creating a brand style guide for the first time, try our Free Brand Guidelines Template to help get you started. Below are the main areas to consider, with examples. You have spent time and money crafting the perfect logo for your business. Also, you want to keep it that way, whatever platform it is being used on. After all, it is the symbol of your company and its most recognisable asset. Therefore, consistency is important. In your brand guide, you should clearly show how the logo is to be used, including acceptable and unacceptable alterations, and correct logo placement. You may have a few variations, in which case you should spell out the circumstances in which each one should be used. Does your logo come in one colour or several? Do you have one variation for light backgrounds, and another for dark backgrounds? Is there a monochrome alternative in case of fabric labels or low-budget printing? 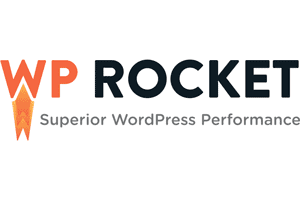 How much space should be left around the edges of the logo, so it does not become crowded by other content? What is the ideal size for your logo in printed and digital content? How shouldn’t the logo be used? 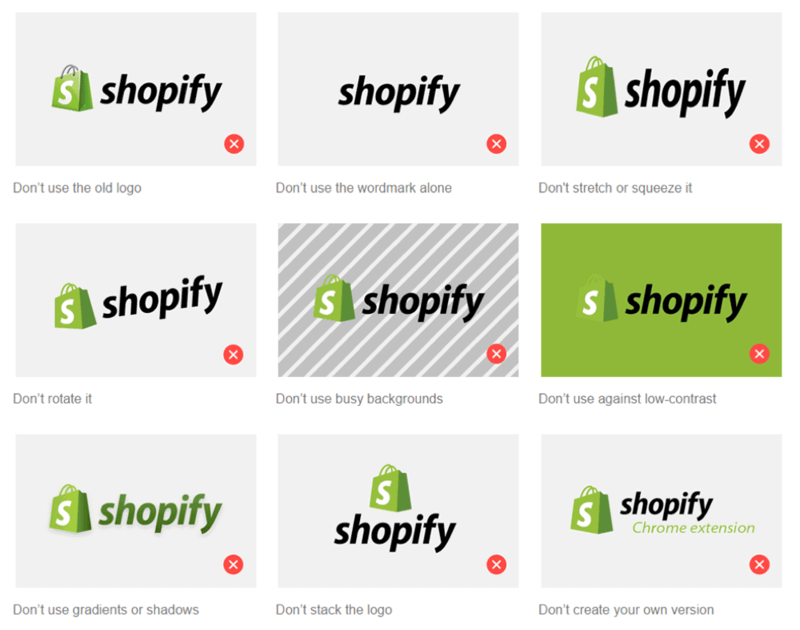 Ecommerce brand Shopify provides clear rules about its logo usage. 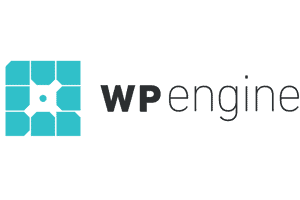 In the image below we see its two primary variations: the main logo and the inverted logo. Shopify then also gives a range of examples showing how the logo should not be used, such as stacked, stretched or on a busy background. This makes it clear to any external designers what the parameters are, and avoids any questions about what is and isn’t acceptable usage. Unless monochrome is your thing (perhaps your brand is aimed at goths? ), then it is likely you will use at least one or two colours in your branding. Colour has the power to drastically change the feeling of your brand, making it appear more youthful and exciting, more reliable or more luxurious. 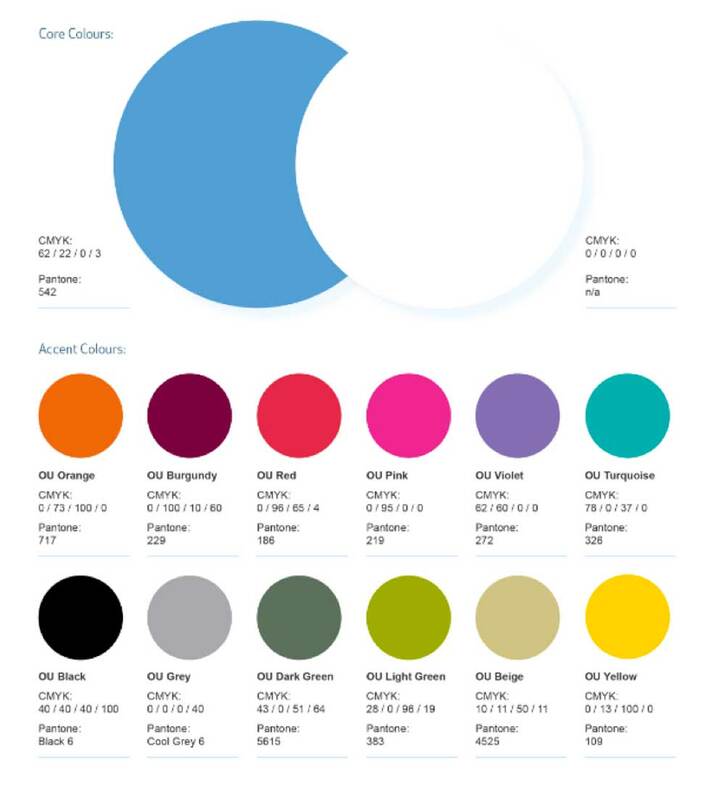 Every colour has an emotive quality attached to it – so it is critical to choose colour combinations that say the right thing about your business. It is easy to get overexcited by colour, and the truth is that for the most part, less is more. Much better to use one or two strong, impactful colours than to opt for an entire rainbow. So likewise, you want to ensure that these colours are used consistently across your communications. After all, one shade of green can vary drastically from another. Trying playing around with a colour scheme designer for some inspiration. When dictating the use of colour in your brand style guide, be sure to outline which is your principle brand colour, and which are the supporting colours. It is also helpful to include the Pantone swatches and HEX codes, to ensure that there isn’t any guesswork involved. The Open University has two core colours: white and light blue. These are the colours used in its logo. It then has a sub-palette of supporting colours that it uses to add contrast and emphasis. Note how the colour references are provided for clarity. As the owner of your company, you probably have a good idea of what photos and graphics are ideally suited to supporting your brand identity. But not everyone working on your branding will have this same knowledge, and therefore it is important to include some guidance in your brand style guide. This is a good place to use lots of examples for inspiration, a little like a mood board. Showcase the times when imagery was used to great effect in your branding, and explain what you would like to see more of. 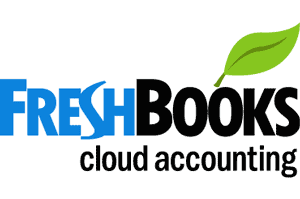 You can also include examples of other brands with a similar theme. This mood board should help to give your design team a clear idea of the style they should aim for, as well as the feeling you want your brand to convey. This will also be relevant to how your brand communicates – for example; you might choose different imagery for a brochure, than you would for an Instagram post. 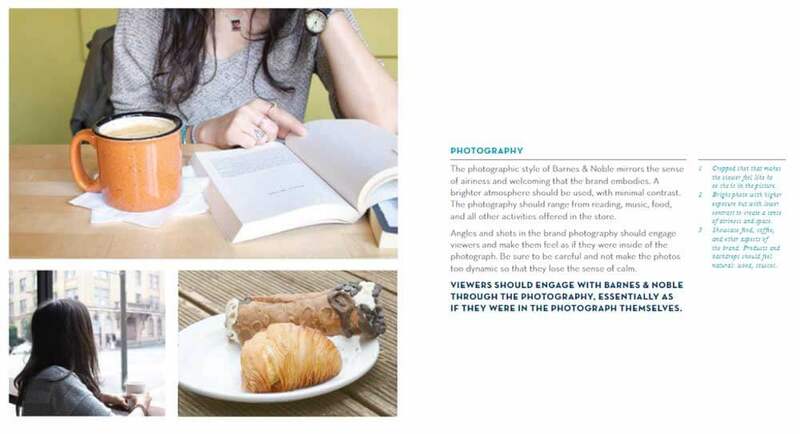 In this example from the Barnes & Noble style guide, it is explained that all photography should embody a bright, welcoming atmosphere that should engage viewers and make them feel part of the photograph. They should focus on relaxing activities such as reading, music and food. In doing so, Barnes & Noble promotes an image of calm and serenity. Another super important part of creating a brand identity is choosing (and sticking with) the right font. You may decide to use one typeface or several complementary ones. It is a good idea to use a different font entirely for your logo, as this will help it to stand out from everything else on the page. A graphic designer will be able to help you choose the appropriate font for your business. You can also check out these 20 perfect font pairings for ideas. Whichever typefaces you settle on, make sure you give very clear instructions for when each one should be used. Which is used for headlines, and which for body copy? Should you align right, left or centre? What tracking and kerning ratios should be used to maintain consistency if the font is a different size? The Bosphorus brand has three text variations: a light sans-serif, a bold sans-serif and a medium serif. Labels and instructions clarify when is appropriate to use each one. Lay out your brand typefaces clearly and provide examples of correct usage where possible. Your brand voice – its personality and how it expresses itself – is just as important as style. Just as you want your brand to walk the walk, it should also talk the talk. For some brands, this is no problem, as they have one writer covering all communications who can maintain a sense of consistency in their chatter. However, for larger brands, it is often the case that they have several people writing for them, perhaps agencies and freelancers. For this reason, it is important to cover tone and targeting in your brand guide. Should the brand voice be playful, authoritative or conversational? Who are the primary audiences you are speaking to? Include some examples of content that would be considered on-brand and off-brand. You may even have certain words and phrases that you lean towards, and others you should actively avoid. 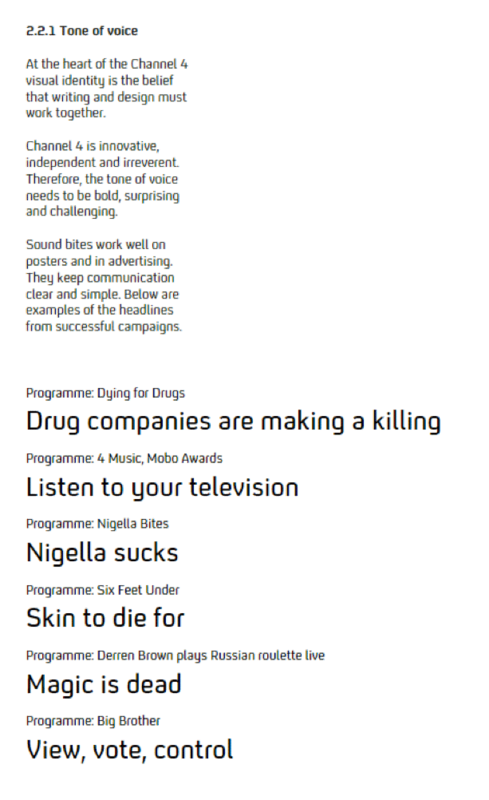 In Channel 4’s brand guidelines, they have explained the personality that justifies the tone of voice – ‘innovative, independent and irreverent’ – and gone on to give examples of headlines from some of their most successful campaigns. Consider what tone of voice can do for your brand, and make it as easy as possible for external writers to emulate. Remember, your company as a whole is far more than just the products it sells. It is why your customers should choose YOUR company over someone else’s. Moreover, the point of having cohesive branding guidelines is to make sure that whoever is responsible for your communications manages to stick within the given visual and written style and ensure your branding is consistent. 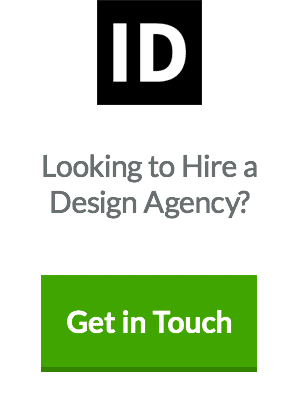 Do it once, and you will save considerable time briefing new agencies and freelancers in the future. As a business owner and digital marketer, I understand the power and importance of good branding. I write for a range of online publications worldwide and also for my website, EcommerceTips.org.